The Rocky Mountain Elk Foundation (RMEF) is celebrating 27 years of protecting and enhancing habitat to ensure the future of elk and other wildlife. Since the organization was founded in 1984 more than 5.9 million acres of critical habitat have been protected and more than 626,000 acres opened or secured for public access for hunting and other outdoor recreation. The RMEF has been a strong partner and financial supporter of weed management projects as part of their habitat stewardship program. “We provided a grant to our first cooperative weed control project in 1989, just five years after the RMEF was founded,” says Toman. 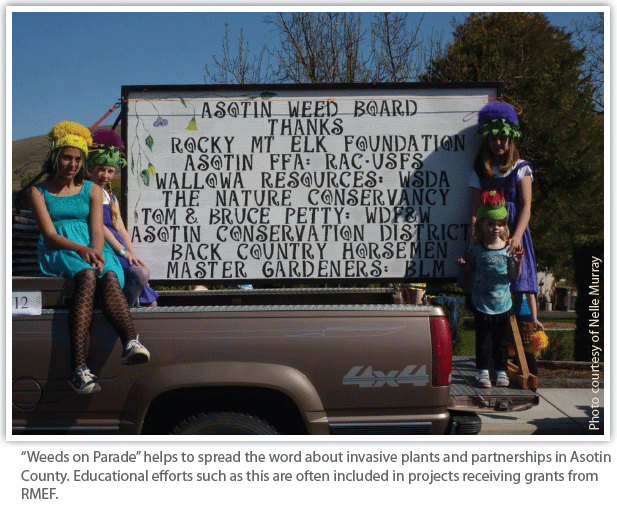 “Since that time we’ve funded 536 projects in 24 states and invested more than $4.3 million to control noxious weeds. Our grant dollars are allocated on a cost-share basis, so they’ve leveraged more than $20.8 million from public and private partners to control weeds on 375,000 acres in prime elk habitat. If you figure that every acre directly treated protects at least two more, our efforts have likely impacted over one million acres of wildland.” Although the bulk of cooperative weed control efforts supported by the RMEF are located in the western states of Montana, Oregon, Washington, Wyoming, Idaho and Colorado, projects range as far east as Pennsylvania and as far south as New Mexico and Arkansas. “One of the only blessings of weeds is that we see a lot more collaborative efforts than we’ve ever seen before,” says Toman. “That’s the only way it can really work – to have all the landowners participating and pulling together.” To foster cooperation among partners, the RMEF requires at least a 50 percent match in their grants to weed management projects. “Partner dollars are important because it confirms the agency or private landowner commitment to the project and we also get a lot more acres treated,” explains Toman. Funding requests for invasive plant control projects are closely reviewed to be certain the work will directly benefit elk and other wildlife, and that there is a public benefit to the project. This is easily met if the area provides an important seasonal range for elk such as winter range or calving area, and elk are available for viewing and/or hunting on the property or on adjacent public lands. Weed management tools used on projects include herbicide treatments, manual and mechanical control, biological control agents, reseeding and restoration projects, prescribed burns in combination with noxious weed treatments, and public education and outreach. The RMEF and Washington Department of Agriculture joined forces to fund a cooperative project between Washington Fish and Wildlife and Asotin County Noxious Weed Control Board to control Mediterranean sage, a Class A* noxious weed in Washington. A 300-acre infestation was treated in 2007 with an aerial application of Tordon® 22K at 1 quart per acre (qt/A) with a follow-up aerial treatment in 2010. “We use backpack and horseback ground crews to control the weed in spray shadows from the aerial application and to treat satellite patches outside the main infestation,” explains Murray. 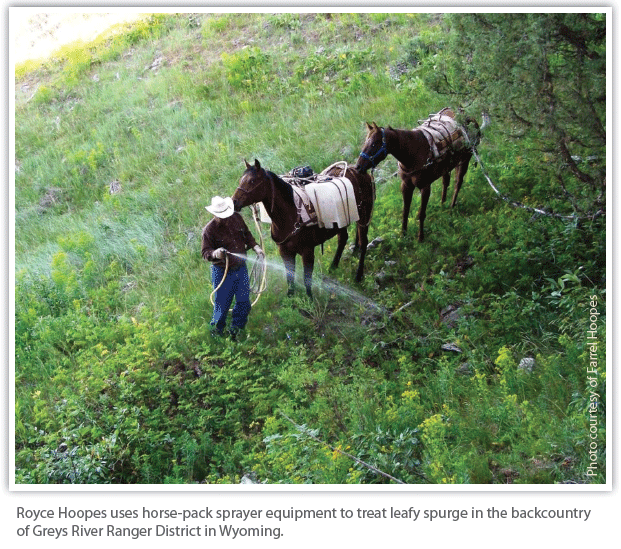 Another prime example of pulling together is the Greys River noxious weed control project located in southwestern Wyoming about 60 miles south of Jackson Hole. The project encompasses more than 65,000 acres of critical wildlife habitat on United States Forest Service (USFS) lands. “This area provides important summer, winter and transitional range for just over 2,000 elk,” explains Don DeLong, Program Manager for Wildlife, Range, and Weeds for the Greys River Ranger District. The area also provides important habitat for other large mammals including mule deer, moose, bighorn sheep, black bear, and an occasional mountain goat, grizzly bear, and gray wolf. Tom Toman can be contacted at Tom@RMEF.org for additional information on the RMEF noxious weed grant program. *Class A noxious weeds are new invaders with limited distribution in Washington that pose a serious threat to the environment. Prevention of seed production is mandated statewide with the goal of eradication. ®Trademark of Dow AgroSciences LLC.